“The lady is a tramp...She gets too hungry for dinner at eight.” So sang Sinatra. If the lady in question were a tourist in France, her “tramp” status would be hard to maintain. She would have to wait for dinner at eight. Most restaurants don’t even open their doors until 7:30. Even that time is approximate. On a recent visit to Marseille we showed up punctually. Initial signs looked promising. Other diners were already seated. Closer inspection revealed that this was the staff. They were enjoying their own dinner, in no hurry for customers to come through the door. Faced with two different signals, a written one which said that the restaurant opened at 7:30, and a live tableau which said, “7:30 really means closer to 8:00” we opted to follow the latter. Returning, after a leisurely 20 minute walk around the port we were the first arrivals. Even if the doors really opened at 7:30, being “too hungry for dinner at eight” would remain a problem. Service is relaxed and cooking takes time. This is disconcerting for Americans who always hear the clock ticking. Such habits can only lead to frustration for visitors to France. A good meal involves waiting. Waiting, first for the server, often there is only one, to approach and take orders. Then, waiting for the appetizer to be prepared. Then, well the pattern is pretty obvious. In an unexpected twist, the server does not even hurry along the check. This would be rude to guests. Often, it is the clients who have to ask for the bill. There is certainly no question of someone swooping down and taking away the plate of one diner while the others are still eating. This abusive custom, signalling “we just want to maximize lucrative efficiency by moving people in and out as quickly as possible” is so prominent in the U.S. that its impoliteness often goes unnoticed. 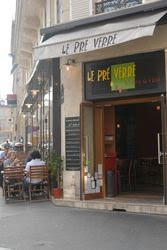 Dining in France definitely does not represent what Americans would call an efficient maximizing of time. Heaven forbid restauranteurs should be seen as trying to move as many people as possible through the dining area to maximize profits. We have even been refused entry into what was an empty restaurant. Very sorry, says the maitre d’, but all our tables are reserved. What he means is that, although it is 7:30 now, at 9:00 the tables will be all taken. Letting us in might mean that a table would still be occupied at 9:00. There is no question of letting that happen. The whole intersection of time and food famously marks a significant difference between the U.S. and France. There are cultural markers for the differences. One was the 1950s game show “Beat the Clock.” Contestants had to perform challenging tasks as a large clock ticked off the seconds. Time, it symbolically said, was something to be occupied by frenetic activity. 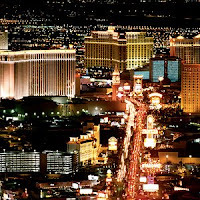 A city favored by Sinatra, Las Vegas offers another important symbol. There, the natural cycles that were the original markers of time have mostly been obliterated. 24/7 is the rule 365 days a year. Day and night do not matter. Nor do the seasons. The notion of limits, patterns or cycles that depend on the natural order of things has been overridden. Not surprisingly, the city is renowned for its “all you can eat” buffets. In such a setting, agricultural practices that serve as the base of any culture (itself an agricultural word) are ignored. The farmer must pay attention to nature’s own measures of time. Day and night, along with the seasons, do matter. Life must adjust to a chronology dictated by something other than human will. When cultivation and growth of foodstuffs can be ignored, when money is earned simply by exchanging money, then thinking solely in terms of clock time rather than nature’s time becomes possible. Most of us have not gone so far as Las Vegas in forgetting our natural setting. We still retain some sense of the agricultural cycles. We can imagine a world which at least has pockets when “beat the clock” is not a preoccupation. The leisurely pace of evening then becomes something to be welcomed. An an oncoming temporal expanse, it can be viewed as a gift. As a gift, it is meant to be savored, not seen as a constraint within which as many tasks as possible have to be accomplished. Turist and expats there thank heavens, that in Spain they serve tapas all through the day. As a result, when I lived in Spain, by 8pm I was usually too satisfied to be able to eat any dinner. Which was ok, as Spaniards celebrate their lunches and in Andalusia take 3 hours lunch breaks: 2pm to 5 pm. This is one of the real reasons to go camping (and I mean real camping). You really learn to live with the cycle of the sun. You get up when the sun gets up and you go to bed when the sun goes down (more or less). It makes you realize how much we artificially throw ourselves off this pattern.